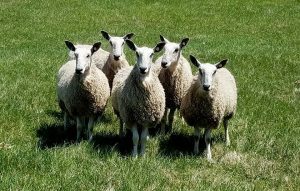 The 2018 Maryland Sheep & Wool Festival is this weekend, and here’s a photo of the yearling Bluefaced Leicester ewes that will be featured in the Working Sheepdog Demonstrations. The sheepdog demos are always well attended, and the crowds there will be able to see how lovely BFLs are when moving around the arena. So, I would like to take this opportunity to thank the Bluefaced Leicester Union of North America for once again helping to sponsor our demonstrations. We certainly appreciate the BLU’s support!